At Clos, Russell & Wirth, P.C., based in Westland, Michigan, we pride ourselves on being a truly different law firm. Our staff consists of dedicated professionals who take pride in getting to know clients and responding efficiently and effectively to their needs. Since 1994, we have provided a wide range of legal services in several areas of the law, including family law, divorce and estate planning. If you are dealing with a family law issue, we can provide expert advice and counsel with a personal touch. One of our attorneys will meet with you in person to understand your situation and provide solutions that fit you and your family. We can advise on all aspects of family law, including divorce, child support, custody disputes, property settlement, prenuptial agreements and bankruptcy. If you have estate planning needs, we can help ensure that your personal and business assets are distributed properly upon death and avoid potential state and federal tax issues. We can prepare and execute all documents needed to initiate your plan, including wills, living wills, trusts, powers of attorney and health care directives. 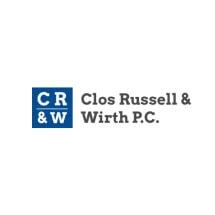 Clos, Russell & Wirth is made up of attorneys and support staff from diverse backgrounds. We are dedicated to working hard for our clients, making sure every detail is covered and every question addressed. We will get to know your case intimately and make sure your goals, wants and needs are represented. Our law firm's certified mediators can also help settle business and personal legal disputes. If you need help with a family law, estate planning or other legal issue, contact us today for an initial consultation. From our Westland, Michigan, law firm, we serve clients in the Detroit metro area and throughout Michigan.